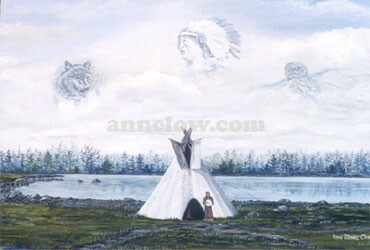 Vision of Spirits In this painting the native woman beats on her drum to call forth the great spirits as a sacred fire burns in the tepee. The wolf symbolizes guardianship, strength, loyalty and inner spirit. The owl symbolizes magic, wisdom and a healing power. The grandfather spirit is a protector and uses the owl and wolf for his medicines and his helpers.